In the Community - HTG, Inc. The practice of giving back is not an obligation begrudgingly adhered to at HTG. Conversely, it is an important part of our culture borne from our teams’ desire to participate positively in our communities, locally and globally. The culture of volunteerism here at HTG is not new but posting about their dedicated efforts is! Read more about ongoing efforts both locally and overseas. 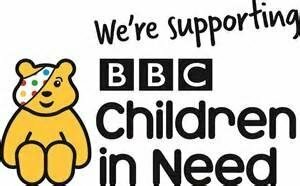 With our UK partner, Vitrx, HTG has been supporting our customer’s charity of choice – BBC Children in Need. Since 2010, we have supported fundraising activity as their sponsor and we are proud to continue that partnership. Check out this worthy cause. HTG is working with Share Vancouver this year, holding a holiday donation drive for the homeless and low-income people in Vancouver/Clark County from 12/4 through 12/22. HTG is personally delivering food, clothing, and toiletries to Share on 12/22. Our goal is 1,000 lbs! HTG’s Christmas Committee is like no other! Thanks for all you do to make the season memorable! Food Drive Results – Congratulations! HTG Participants More than Doubled Last Year’s Results! Huge thanks to everyone who helped out with organizing this year’s food drive in honor of Skyler, and bravo to all who contributed donations. We collected 1,458 pounds of food, which means – according to reps at Allen Temple – 1,215 meals for our community’s most vulnerable population, the hungry. Way to go everyone!! Allen Temple and HTG volunteers loading and transporting donated goods. We are happy to announce our partnership with Bridge the Gap, an important local organization working hard to meet the needs of foster children in our area. Our President is matching all funds raised by our giving employees. In honor of our employee, Skyler, whom we sadly lost this year, we are continuing our holiday food drive efforts with his favorite Portland charity. He had a strong connection with this organization, and we are pleased to partner with them again in his name. Skyler, you are not forgotten. We were pleased to be able to donate Dell PCs to the Firm Foundation Christian School in Battleground, Washington. HTG's dedicated Support Center/Field Dispatch Team along with the ITAD, Engineering, Sales & Service teams work hard every year to provide funds, technology, food, clothing and toiletries to our community's most vulnerable populations. Bravo Teams!